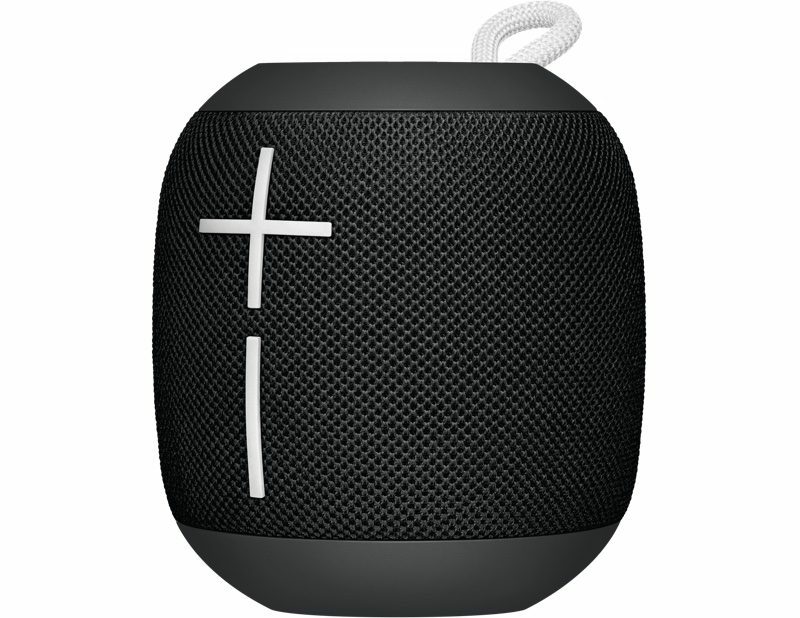 Ultimate Ears today announced the latest addition to its lineup of portable speakers, debuting the palm-sized $99 WONDERBOOM. The WONDERBOOM fits right in with its bigger siblings the UE Boom 2 and the MEGABOOM, offering 360 degree sound in a smaller, more affordable package. Design wise, the WONDERBOOM looks a lot like the UE Boom 2, but it's half as tall and a bit thicker. It's 10.2cm tall with a diameter of 9.4cm, while the UE Boom 2 is 18cm tall with a diameter of 6.5cm. The front of the WONDERBOOM features the iconic Ultimate Ears volume control buttons, denoted by a "+" and a "-", and at the top, there's a power button and a Bluetooth button for pairing the WONDERBOOM to an iPhone. A UE button, also at the top of the speaker, pauses and unpauses music that's playing. A double tap on the UE button will skip to the next song. The WONDERBOOM connects to a device through a standard Bluetooth connection and it is designed to maintain its connection up to 100 feet away. All of the Ultimate Ears products offer surprisingly great sound for both their size and price point, and the WONDERBOOM is no exception. In our testing, it wasn't far off from the sound of the UE Boom 2 and it was louder and carried more than the sound from a UE Roll. Sound was clear, even at high volume, and the bass was impressive for a small speaker. 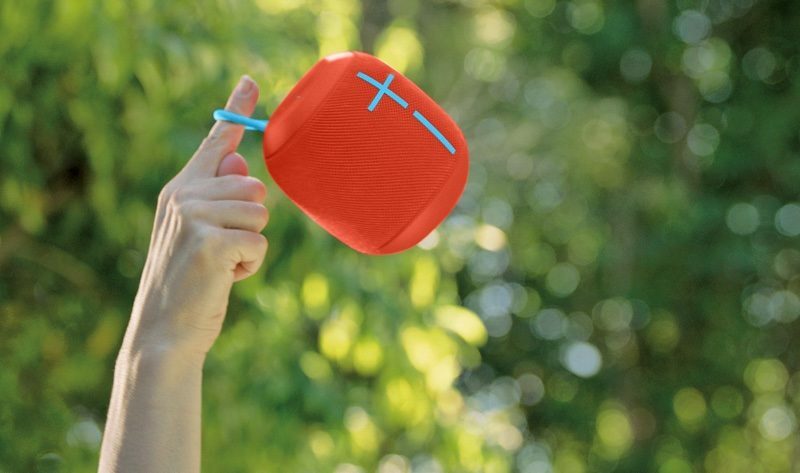 Two WONDERBOOMs can be paired together (a long press on the UE button puts them into pairing mode) for larger spaces and louder sound, and there's also a feature that allows two Bluetooth devices to connect to WONDERBOOM so multiple people can control the music. 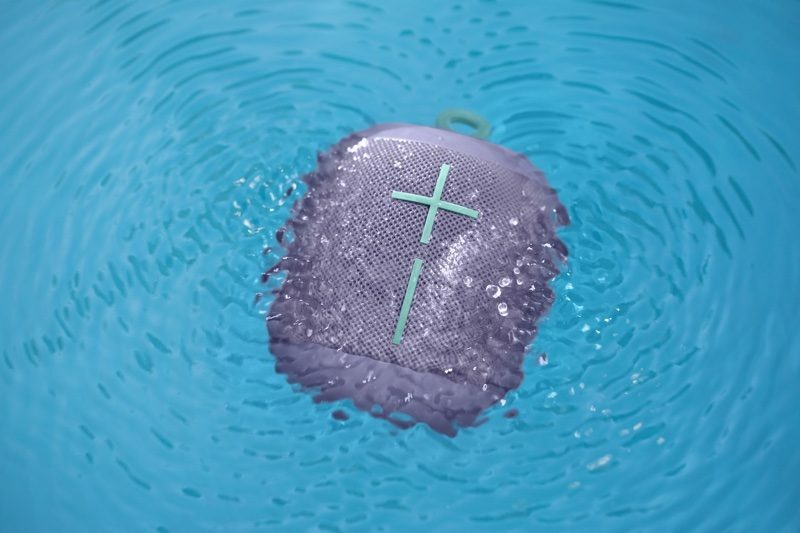 A loop on the back of the WONDERBOOM allows it to hang anywhere, and it's also waterproof (IPX7) and able to float, making it ideal for use at the pool, the beach, or in the bath. It can withstand immersion in up to one meter of water for 30 minutes. It's also rugged, making it an ideal outdoor speaker -- it's drop proof from up to five feet. WONDERBOOM charges using an included micro-USB cable, and it offers 10 hours of battery life per charge, long enough to last for a full day. WONDERBOOM is priced at $99 and it is available in six colors: Stone (gray), Phantom (black), Fireball (red), SubZero (blue), Cashmere (pink), and Lilac (light purple). Ultimate Ears will begin selling the WONDERBOOM on its website in April of 2017. I never post but I'm on this site several times a day. I just had to say something this time. Seriously? All people want to talk about is the volume buttons on this speaker? They've used the same design for years. It just goes to show people just love a cause and have to have something to complain about...... Don't like it? Don't buy it, but please don't bore us with complete useless opinions about the volume buttons...... PLEASE!!! I can't tell how many of you are kidding about this "cross" thing, but I hope...all of you? Finally, a speaker designed for Christians. This speaker can walk on water. I mean work under water. Beautiful designed and well priced like many of their products. They have great products. I hope Apple updates its Beats Pill lineup. How does it compare to Cambridge Sound Oontz Angle 3 Plus for almost 1/3 the price? I don't know how it compares on sound quality, but the Oontz looks like it's only rated IPX5 when it comes to water resistance, the WONDERBOOM is IPX7. You can read more here https://en.wikipedia.org/wiki/IP_Code but very roughly summarized, that's the difference between "will survive being caught in the rain" and "will survive being dropped in the pool". The Oontz also advertises Bluetooth range of 30 feet, and the WONDERBOOM advertises 100 feet. Sound quality would still be a huge factor for me, so I'd wait to read some reviews (I like The Wirecutter) if I was considering this, but at a glance, those are some "objective" differences. UE Boom is one of the best tech products I ever bought - this looks cute!